Holi is a Hindus Festival celebrated widely across India. It is a festival of colors celebrated with joy and love. Below are few easy written essay on Holi festival let your kid know more about this religious festival. Holi is a festival of color celebrated every year in India. Holi has a story behind it King Hiranyakashyap called himself and force people to pray his Idol. He and his sister were evil. But his son Prahlaf didn’t pray his father instead he was a devotee of Lord Vishnu. So the king was very upset with him and try to kill him many time but he failed. One day he told his sister to take Prahlad in his lap and sit on fire. Holika wrapped herself in a shawl which was protecting her from fire. However, Lord Vishnu saved Prahlad and Holika get burned to ashes. So every year bonfire is made by peoples which is celebrated as Holika Devan which gives a message to burn away evil thing and pray for good. Holi is a joyous celebration of rejuvenation of nature and renowned hope of happiness and peaceful coexistence. People throw colored water and color powders (gulal, abeer) at each other and celebrate Holi. Singing and dancing add to the gaiety of the occasion. The effervescent display of colors symbolizes the arrival of a colorful and prosperous spring season. People eat and distributes sweets to neighbours and relatives. In India everyone celebrates Holi but there are very few people who knows the reason behind its origin. Holi is an ancient festival of Hindus and was known as Holika. Its origin was connected with the story of Prahlad was a devotee of lord Vishnu and his father Hiranyakashyap bounded everyone to worship him and whoever go against him he will kill them. But as Prahlad was a great devotee of lord vishnu, Hiranyakashyap went to his sister Holika who had a boon to remain unscathed by the fire and asked her sister to take prahlad and sit on the fire and she followed his order but as prahlad is blessed by God he got saved and Holika got burned to ashes. From that very movement, Holi is celebrated as the festival of the victory of good over evil. Even today bonfires are lit on the night before colorful Holi and the event is called Holika Dahan. Many different sweets like gujiya, laddoos are prepared and distributed among friends and family which marks the togetherness and love. Basically Holi is the only festival where people forgets everything and enemies also become friends. In Holi even the old heart become young and enjoy the festival at its best. Holi is one of the most favourite festival of Hindus loved by people of all age group. It is a festival of colors. This festival comes on a full moon day in Month of Phalgun according to Hindu Calendar every year and celebrated with great joy. Holi Festival is widely celebrated in India, Nepal and other places among Hindu population. But in recent times, this festival has also gained popularity among Non-Hindus. This festival has a story behind it and that is about Prahlad. There was a demon king named Hiranya kashyap, who had a son, named Prahlad, who was a great devotee of Lord Vishnu but Prahlad’s devotion enraged Hiranyakashyap and he makes plan to kill his son Prahlad. Hiranya Kashyap’s sister named Holika has the power to get immune from fire so he asked her sister Holika, to sit in fire taking Prahlad in her lap and she did the same but Fortunately Prahlad, who was blessed by Lord, was saved and Holika was burnt in fire. So on this festival people celebrates the triumph of good over evil and burn holika and it is popularly known as Holika Dehan. Next day in the morning every one plays Holi with colors and Gulals. People throw water balloons on each other. People visit friends and families to spray colored water on them. People roam around streets and throw colored water balloons on everyone. Some people that don’t wish to get wet play with dry colors and flowers too. It is the festival of lots of fun and joyful activities especially for the kids who take part in the celebration a week before and lasts a week after the festival. Everyone sprinkle colors on each other using buckets, water guns, Pichkari etc. The whole atmosphere is made even more lively with music (bhajans) and people dance to the tunes while enjoying the colors. People celebrate holy eating yummy dishes like gujhiya, sweets, dahi bhalle, chips and so many other and also distributes sweets to friends and relatives. 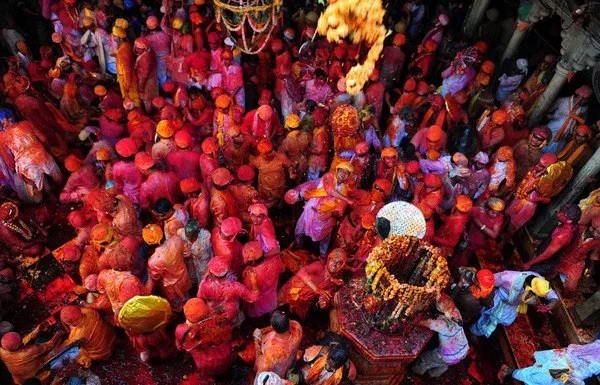 While Holi is celebrated in every part of India and Holi in Braj is very famous. Braj is a historical region India covering the area of Mathura and Vrindavan. 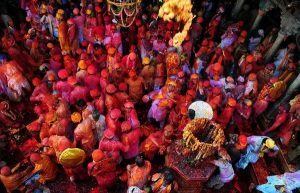 Braj Holi attracts thousands of tourists and pilgrims from all over the world to enjoy the religion and traditional Holi. Lord Krishna was born in Mathura and Vrindavan is the place where he grew up. When Krishna was young, he complaint to his mother Yashoda why Radha has a fair complexion and he has a dark body colour. She suggested him to colour Radha with colors in a playful manner. Over the years, Krishna used to go to Radha’s village Barsana to color Radha and other Gopis and the gopi’s also used to beat him with sticks. And hence the tradition evolved and the festival is famously played in Braj with flowers, colors and sticks. The Banke-Bihari Temple in Vrindavan is one such place to enjoy the festivities as it hosts a week long Holi celebrations.